Flightpaths: the lost journals of Amelia Earhart. Heidi Greco. Caitlin Press. Halfmoon Bay, British Columbia. 2018. Reading Heidi Greco's Flightpaths: the lost journals of Amelia Earhart is like falling into a Saturday afternoon matinee at the movies of my youth. Greco has imagined and made real all those things we've so longed to discover about the ending to the Amelia Earhart story, the beginning of the legend. Greco's done her homework. Today's book of poetry knew about the "friendship" between the high flying aviatrix and the President's wife. But Greco takes them up among the stars where they make snow out of one of Eleanor's boas. Greco reveals dark secrets and hidden gems, jewels for the inquisitive historian. The theories Heidi Greco expands on as to the demise of Amelia Earhart have been given light of day before but Greco affectionately moves past rumour to give rich flesh and bone back to the narrative. Just like those afternoon movies of my youth; Greco sets up the audience and then delightfully mows them down. Made an awkward wade to the plane, for another quick series of maydays. at how ladylike I've become. Heidi Greco's Flightpaths: the lost journals of Amelia Earhart offers up more than one solution to the famed pilot's true story. We deduce that Earhart had an open relationship with her husband and a thoroughly modern and adventurous dance card that spanned both gender and expectation. These poems fantasize more than one perilous end for Earhart, but any real fan of Earhart, or any ardent reader, will already have heard these theories. What Greco does that amazes is to create a narrative the reader can and does believe. We believe the movie as it is playing out in front of us. 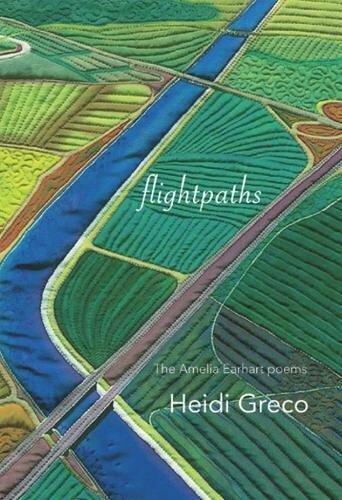 With a variety of conjured tricks, Heidi Greco has us eating her fictionalized account of an unknown story right out of her poetry hands. She doesn't even bother with a poetry bowl. Greco gets us to believe a thing is true even though we already know it is made up. That's some good poetry cooking. he slicks into his thinning hair. "An army marches on its feet,"
fill the needs of his mind. in the factory, if I could. the ones who didn't behave. the sentence I must serve, rest of my too-lifeless days. anything to fire up my engines. Today's book of poetry morning reading was just a little off track today, everyone remains a little subdued and saddened by the passing of the great Canadian poet David McFadden. Earlier this week David finally succumbed to a lengthy illness. David McFadden was a big influence on Today's book of poetry. Mr. McFadden had been to our home a couple of times and for a brief period of time we corresponded regularly. We were never buddies but we were friends. Today's book of poetry was very honoured to be included in 70th birthday book for David. We weren't buddies — but I wish we had been. David McFadden was looked to up by an entire generation of Canadian poets and Today's book of poetry is saddened by his passing. Stuart Ross, celebrated poet and close friend, has suggested that he is going to read a David McFadden poem at all of his readings in the future. Today's book of poetry thinks we should all follow the same plan of action. After a round of David McFadden poems, mostly from Poems Worth Knowing (Coach House Books, 1971), we got back in to the proper flow and gave Heidi and Amelia a proper flight test. Heidi Greco puts belief in the hands of the reader. We come to believe that this movie is real. Poetry that transports is a hard currency to deny. Flightpaths is money. Heidi Greco is a longtime resident of Surrey, BC. In addition to writing and editing, she often leads workshops – on topics that range from ekphrastic poetry to chapbook making. She’s been an advocate for the literary arts in her community and was instrumental in establishing two distinct reading series, but she considers her greatest success to have been convincing her city to hire an official Poet Laureate. She writes in many genres – with poems, fiction, essays and book reviews to her credit. Her books include a novella, Shrinking Violets which was co-winner of the Ken Klonsky Award in 2011. Her work has also appeared in many anthologies, most recently in Make it True: Poetry from Cascadia (Leaf Press, 2015) and The Revolving City: 51 Poems and the Stories Behind Them (Anvil, 2015). In addition to making Sunday suppers for her adult sons, she keeps a sporadic blog at outonthebiglimb.blogspot.ca.